If you decide to purchase a Kenmore gas oven, it's important to know that they are originally set up to use as a natural gas system. If you want to make it into a LP gas oven system, then you have to convert the oven. Fortunately, this is not a difficult process. Your oven may come with an oven kit, so all you have to do is install it and adjust the flame. 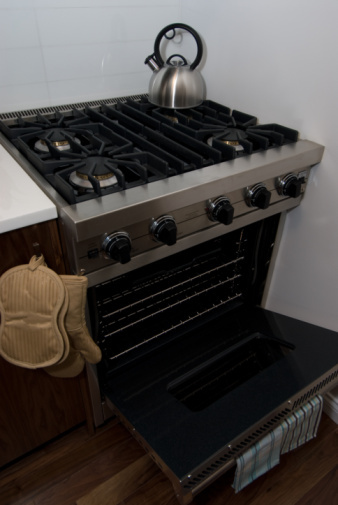 Even though it's a relatively easy process converting your Kenmore LP gas oven from natural gas to propane, adjusting the flame can be a nuisance. The reason why is that seldom do the ovens come with instructions to adjust the flame. Thankfully, it only takes a few minutes to adjust the flame once you know what you're doing. Since the oven is close to the wall, you will have to pull it away from the wall to get behind it. When you get behind the stove, turn off the gas. You can use a wrench to disconnect the gas line. Next, you're going to pull the bottom drawer out from the bottom oven. Then, you're going to need to find the oven orifice. The oven orifice is at the back near the burner assembly. Once you locate that, you're going to adjust the orifice by tightening the brass fitting. There are two brass fittings located on the oven burner valve. One is for the oven burner, and the other is for the broiler. The hex nut is located underneath the gas valve, so once you locate the hex nut, you're going to remove it with a wrench. You're going to flip the pin over and reinstall the new hex nut with the wrench. After you do that, you can reconnect the gas line and turn the gas valve back on. Before you turn the oven back on, don't forget to push the oven back against the wall. After you push the oven back, you are going to turn on the gas to check the flame. Since this is a LP gas orifice oven, the flame should be blue with a yellow tip. If the flame is not this color, then you need to hire a technician. Gas ovens are serious appliances, so fix with extreme caution.